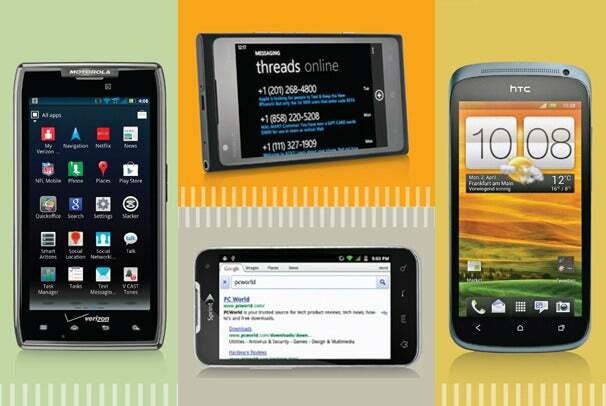 Four of the best smartphones: (left) the Motorola Droid Razr Maxx; (top middle) the Nokia Lumia 900; (bottom middle) the Sprint LG Viper; and (right) the T-Mobile HTC One S.
Shopping for a new smartphone can be overwhelming. So many good phones are available that upgraders may feel swamped with op­­tions. Never fear: I’ve picked the best ones on each of the four major carriers. And since the smartphone world moves incredibly fast, I’ll also tell you about phones not yet out. Worth noting are two upcoming phones I’m excited about but can’t yet recommend, because we don’t know enough about them. One, the Samsung Galaxy S III, will debut in Europe before arriving in the United States. Most carriers likely will get a version of the S III, though so far none of them have confirmed that they will. Another wild card is the fifth-generation iPhone, which hasn’t even been announced yet but is eagerly anticipated. 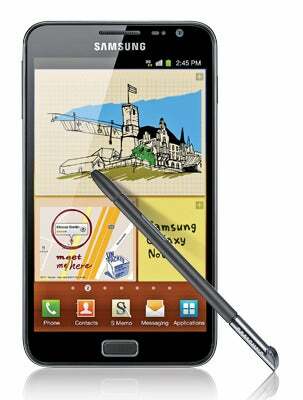 As you might expect, the Galaxy Note also has built-in software and special gestures designed for the pen. One handy app, S Memo Lite, lets you jot down notes from pretty much anywhere in the phone. If you have another app open, the notepad appears on top of it, allowing you to switch back to the original app easily. You can open a fuller version of S Memo from the apps menu. In this fuller version, you can add color to your drawing or text, or insert pictures and shapes. In addition, the Wacom pen mimics its nondigital cousins: The harder you press down, the wider your lines will be. Writing on the Galaxy Note takes some getting used to, but once you master it, you’ll find it’s a lot of fun. The Note can also convert your handwriting into text; it does a pretty good job, though it made a few errors in my testing. Trying the Galaxy Note before you buy it makes sense, however: With its 5.3-inch display, the Note is an unconventional size, bigger than most phones and smaller than most tablets. Some features of the Samsung Galaxy Note (click to enlarge). 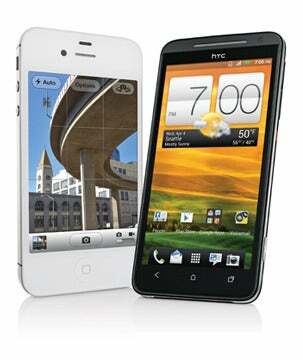 Another hot Android phone is the HTC One X ($200 with a new two-year contract). The models in HTC’s One line of phones have three features in common: a high-quality camera with HTC Image­Sense (HTC’s new camera software), built-in Beats Audio for better-sounding music, and a premium design. The premier phone of the One line, the One X has the best specs of the bunch, including a large, 4.7-inch, 1280-by-720-pixel Super LCD 2 display. Super LCD 2 screens, according to HTC, reflect less glare and offer better viewing angles than the displays on older HTC models. Like all of HTC’s top-of-the-line phones, the One X feels well constructed. The polycarbonate body seems durable but looks attractive. 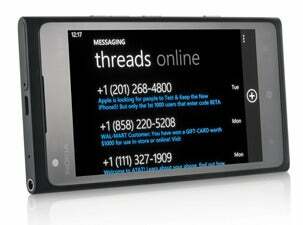 And according to HTC, the One X is scratch-resistant—though we haven’t tested that claim yet. Unlike the global version of the One X, which shipped with an Nvidia Tegra 3 quad-core chip, the U.S. version has a Qualcomm S4 dual-core processor. 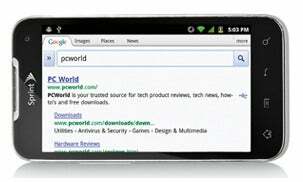 (Nvidia’s processor was not yet compatible with LTE networks when the One X was manufactured.) Despite having fewer cores, the U.S. HTC One X sped through all of our testing benchmarks. If Android isn’t your cup of tea, then consider the Nokia Lumia 900 ($100 with a new two-year contract)—its OS is Windows Phone 7.5. I like the Lumia 900’s unique, stylish design; its stunning display; and its good, 8-megapixel camera. It is also quite speedy, thanks to running on AT&T’s 4G LTE network. If you can wait to upgrade, consider the Sony Xperia Ion, slated to join AT&T’s LTE lineup later this year (no official date has been an­­nounced). I saw the Ion at its CES 2012 launch, and was impressed by its svelte design and high-end specs. The Ion includes a 4.6-inch display, an HDMI-out port, and a superthin design. It also has a 12-megapixel camera, which took great photos in our brief hands-on tests. Sprint’s LTE network hasn’t launched yet, but that isn’t stopping the carrier from releasing 4G LTE phones. The first of these, the LG Viper ($100 with a new two-year contract), is an environmentally friendly Android Gingerbread phone with a solid camera and an affordable price. The phone’s body is 50 percent recycled plastic, according to Sprint. Such Earth-friendly phones aren’t generally stylish, but the Viper is an exception. A chrome border on the phone’s edges nicely complements the piano-black face. The silver plastic backing has a “brushed” finish, giving it a sophisticated look. The Viper feels a little chunkier than other recent smartphones, measuring 4.59 by 2.44 inches and 0.46 inch thick, but it weighs a manageable 5 ounces. The Viper might be easy on the wallet, but it’s no slouch. Powered by a dual-core 1.2GHz Qualcomm Snapdragon S3 processor, the Viper feels snappy. In our tests, it ran three games—Osmos, Edge, and World of Goo—smoothly and without a glitch. One drawback: The Viper ships with the older Android 2.3 instead of the latest version of the OS, Android 4.0 (also known as Ice Cream Sandwich). he iPhone 4S’s premium design, upgraded camera, and faster processor. And like its predecessor, the iPhone 4, the 4S has a stunning 3.5-inch, 960-by-640-pixel IPS display. The iPhone 4S also introduced Siri, Apple’s sometimes-helpful virtual assistant. The $199 Evo 4G LTE is essentially a Sprint-branded version of the HTC One X, but it also promises some unique features, such as HD Voice (see below). The Evo 4G LTE carries a dual-core 1.5GHz Qualcomm Snapdragon S4 chip, a 4.7-inch HD IPS display, and the Android 4.0 operating system, along with HTC’s Sense 4.0 user interface and Beats Audio to make music sound better. In addition, like the One X, the Evo 4G LTE has HTC’s ImageSense software for improving and sharing your phone’s photos. The Evo 4G LTE will be the first phone on a U.S. carrier to come with HD Voice, a technology that significantly decreases background noise. The handset’s built-in kickstand, a design feature we’ve seen on other HTC Evo phones from Sprint, makes watching video on your phone easier. And as the name implies, the Evo 4G LTE will also be on Sprint’s LTE network, once that gets up and running. Sprint will launch its LTE network initially in Atlanta, Baltimore, Dallas, Houston, Kansas City, and San Antonio starting midyear. The carrier hopes to expand to more cities by the end of the year. Next: Phones for T-Mobile and Verizon.